DMA offers a wide spectrum of alternative energy engineering services that are required to design and build your alternative energy plant. These include engineering and project management services in the disciplines of mechanical, electrical and controls, architectural, code compliance and safety. Design is the most effective risk control method, however, a focus on hardware alone is not enough. The training and experience of people such as operators and maintainers coupled with their work procedures must also be considered as these risk controls also affect the integrity of the hardware and engineering design over the life cycle of the facility. DMA believes a comprehensive risk analysis includes people, procedures, hardware and environmental issues set within an integrated management system framework over the life cycle of the design. We also believe in concurrent engineering where people from construction, operations, maintenance and disposal are involved and their issues are identified and addressed early in the design process. Finally, public participation in the design review process is critical for alternative energy projects. For example, the DMA approach to Safety by Design is illustrated by a recent hydrogen station project. Our approach was well received by the United States Department of Energy Hydrogen Safety Review Panel. It met their expectation of “beyond code compliance” and was consistent with their document Guidance for Safety Aspects of Proposed Hydrogen Projects August 2004. Use the power of our experience to select the right components and sustainable energy technologies for your alternative energy applications. Make decisions based on reliability, cost, expandability and efficiency. DMA will provide a complete alternative energy system including transportation and power system design, equipment and installation specifications and drawings, approvals and risk analysis for your transportation and power requirements. DMA's alternative energy project management experts will assist you with planning, scheduling, procurement, logistics, construction supervision, commissioning, acceptance testing and as-built documentation. Ensure a smooth, well executed energy project from start to finish. 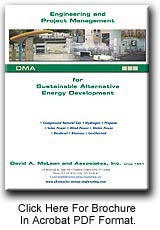 DMA can effectively evaluate your entire sustainable energy project from an economic perspective. Our evaluations are "life-cycle cost" based and include government funding and tax credit opportunities that are available for you to take advantage of. Many Alternative Energy projects are eligible for grants, tax credits or other funding incentives. DMA will analyze the spectrum of funding alternatives that are available to you to streamline your project economics to the greatest degree possible. We will act as your liaison to municipal, state/provincial, federal and international regulatory agencies to ensure that your Alternative Energy System meets all the necessary criteria for its design, construction and operation. Ensure your sustainable energy system complies with all applicable codes and standards and launches successfully. DMA can also provide stakeholder liaison services to ensure that your Alternative Energy System is understood by all participants and is delivering the results that are expected. Stakeholder liaison services include inbound and outbound communication using all forms of media including web-based interactive sites, call centre applications and print-based correspondence. Take advantage of our broad expertise to design your staff and system "user" training programs. Let DMA build a training program formatted for your specific needs including operations manuals, health and safety procedures, maintenance manuals and emergency response plans. DMA will customize Equipment Operating and Maintenance manuals specifically for your alternative energy system. Understand how your sustainable energy system works and how to keep it operating smoothly. DMA can help you maintain your alternative fuel system through remote monitoring. This may include real-time data acquisition, systems monitoring and supervisory control, advanced warning detection and predictive maintenance scheduling, customer billing and collection, data trending and transportation and power system use analysis. Many of our clients adhere to the ISO suite of standards: 9000 (quality), 14000 (environment) and "18000" (safety). We typically take an Integrated Management System (IMS) approach to the preparation of the procedures that we produce so every client can be "ISO compliant" from the outset or at any future time the client chooses. serving customers around the world.